I am about to embark on a fairly ambitious project where I plan to dive deep into the philosophy in Psycho-Pass on an arc-by-arc basis, so I think briefly establishing the world is important before I jump into everything. Psycho-Pass takes place in a futuristic Japan where the Sibyl System measures people’s mental states and the tendencies of their personalities. 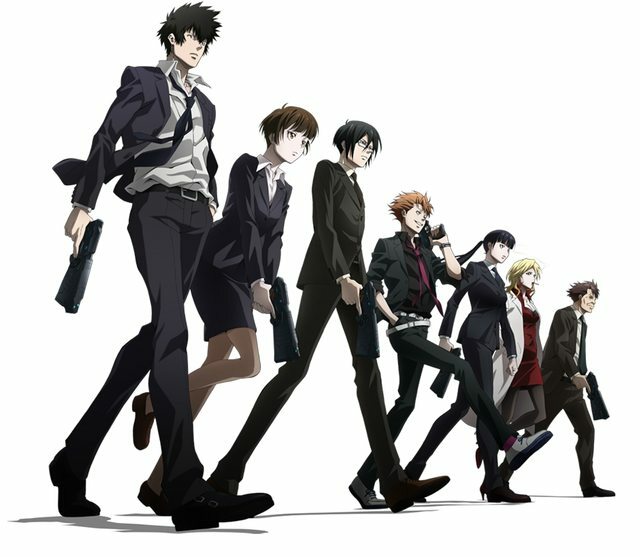 If someone’s “psycho-pass” gets clouded, causing their crime coefficient to rise, they become targets for police action. It is a place where Sibyl’s analyses are able to reliably prevent or halt crime. It is, as much as possible, a peaceful society, free of stress, where Sibyl has matched everyone to the jobs they have the most aptitude for and the partners most suited to them. The story focuses on Akane Tsunemori, who becomes an Inspector for the Ministry of Welfare’s Public Safety Bureau (MWPSB). The MWPSB is tasked with hunting down and subduing those whose Crime Coefficient has become dangerously high. It is a system intended to prevent crimes, in the vein of Minority Report. Working under the Inspectors are the Enforcers, those who have high Crime Coefficients and are labeled “latent criminals,” but who have the potential to be detectives. Enforcers are generally treated like dangerous hunting dogs that need to be leashed and are meant to do the dirty work so that Inspectors can stay out of the line of danger and do not have to worry about darkening their hues. 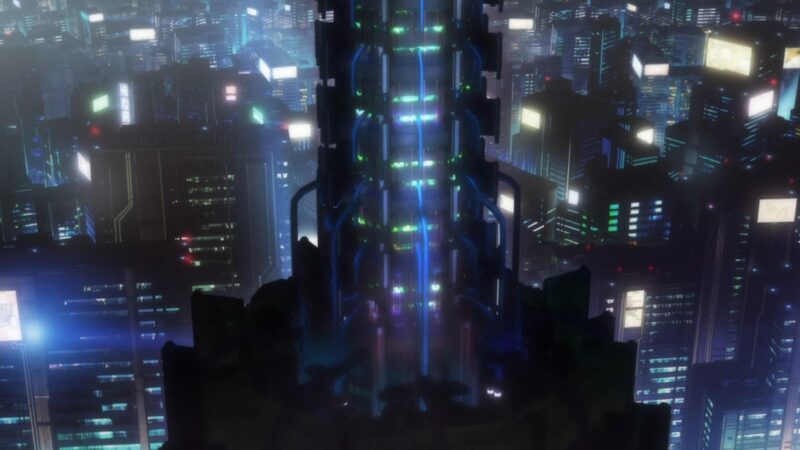 These are the basics of the world seen in Psycho-Pass, and while the story focuses on the darker elements of this society, the overwhelming majority of it is actually quite ideal. In fact, even these darker elements hint at a much more positive ones, such as the Sibyl System’s focus on helping citizens maintain good mental health and its attempts to prevent crime and reform criminals rather than simply imprison or kill them. The structure of Japan as portrayed in Psycho-Pass is actually fairly similar to the society Plato proposes in The Republic. As the show itself makes references to Plato’s philosophies (and “sibyls” were Greek oracles, so the Sibyl System itself is a reference to Greek culture), it is almost certain that writer Gen Urobuchi is familiar with the work, and I do not think it is too much of a stretch to assume he had it in mind while crafting the world. It is a world where people are given purpose and meaning in life by dedicating themselves to what they are most suited to do, it is ruled by a wise philosopher-king (Sibyl) and is protected by guardians in the form of Inspectors and Enforcers. However, Psycho-Pass also heavily critiques this proposed utopia by examining what exactly the cost of a Republic would be. There is a short story by Ursula K. Le Guin called “The Ones Who Walk Away from Omelas.” It is a very short piece in which the narrator proceeds to describe a perfect society called Omelas. It is a society filled with joyful and happy people who are not being brainwashed and are not just ignorant simpletons. The narrator paints this scene for over half the piece. When they sense the reader still suspects a catch, they reveal it: in order for this perfect society to exist, a small child lives its life locked in a basement, unloved and malnourished, wallowing in its own filth. The existence of that one child is what allows Omelas to be such a perfect society. Neither how Omelas can be such a utopia nor how the child’s suffering allows that to be is explained, because it is purely a thought exercise: one where the pain and suffering of a single innocent allow for the continued bliss of everyone else in Omelas. Everyone in Omelas knows of the forsaken child. They learn of it at some point between the age of eight and twelve, when they are able to grasp the idea. Many go to visit the child and want to do something for it, but they know that if they were to do so, it would undo all the goodness that exists in Omelas. The story ends by saying that, while almost everyone who goes to visit the child returns to their life and eventually reconciles the need for the child’s suffering, there are some who instead walk away from Omelas. An unspoken question hangs in the air: if you were in that position, would you? When speaking from an outside perspective, it is easy to say that the moral thing to do is to leave. That no life, no matter how perfect, is worth the price of a child’s suffering. Simply leaving does not harm anyone. You are merely choosing to take an imperfect world upon yourself. But if it were that simple of a choice, why do so few walk away? Why do so many stay? Saving the child is not an option because it saves one at the expense of so many others, but can walking away from the situation bring peace of mind? After all, walking away does not ease the child’s suffering, and it does not bring any more happiness to others. So if your decision cannot affect the child or other citizens of Omelas, it will only have an impact on you. What can you live with? This is what Psycho-Pass is about. It is about the Sibyl System, the entity that allows the prosperity of Omelas to exist. It is about Shogo Makishima, those he influences, and the Enforcers, all of whom are the forsaken children who pay the price for Omelas’s happiness. And it is about Shinya Kogami, the one who walks away from Omelas, and–perhaps more importantly–Akane Tsunemori: the one who stays. [Edit/Addendum: I have had some response insisting that as a utopia is perfect by definition, Psycho-Pass would depict a dystopia. It has consequently become necessary to elaborate. If a utopia can only be defined as a perfect society, it becomes impossible to define a utopia as anything other than an idea. In practice, it is simply impossible, as it requires every member of that utopia holding the exact same values in order to function. Anyone believing in an ideal that goes counter to a proposed utopia’s ideal consequently destroys that ideal. From their perspective, it becomes a dystopia. Great post. It’s given me plenty to think about for a show I’ve already spent a lot of time thinking about. Thanks for sharing. Thanks! I plan on covering just about every arc of the first season in-depth, so hopefully I’ll be able to give you even more to think about moving forward. I need to watch Psycho-Pass now, if only so that I can keep up with these posts as you write them, because that was really great. I also feel like I now have a small list of literary works to read as well–I’d never read any of LeGuin’s stuff (though I’ve seen her works in the bookstore many times), but that story sounds *fascinating*. The full text is linked in the post and it’s very short, so go ahead and give it a read. i think i vaguely classify dystopian fiction as portraying what could follow from current, dominant trends in society, e.g. cyberpunk from supercapitalism, and utopian or anti-utopian fiction as portraying things more akin to philosophical thought experiments at the societal level. however, i wouldn’t completely agree that the sibyl system is a better society than most that currently exist. at its core, it takes ad absurdum the idea of a system based on a single idealized model and measure of a human being, i.e. normativity, which is the basis of most modern forms of discrimination. the fact that one of the theories to dismantle the sibyl system involved opening the country to immigration is an indication that its success is primarily in the homogenization of its society for easy management.